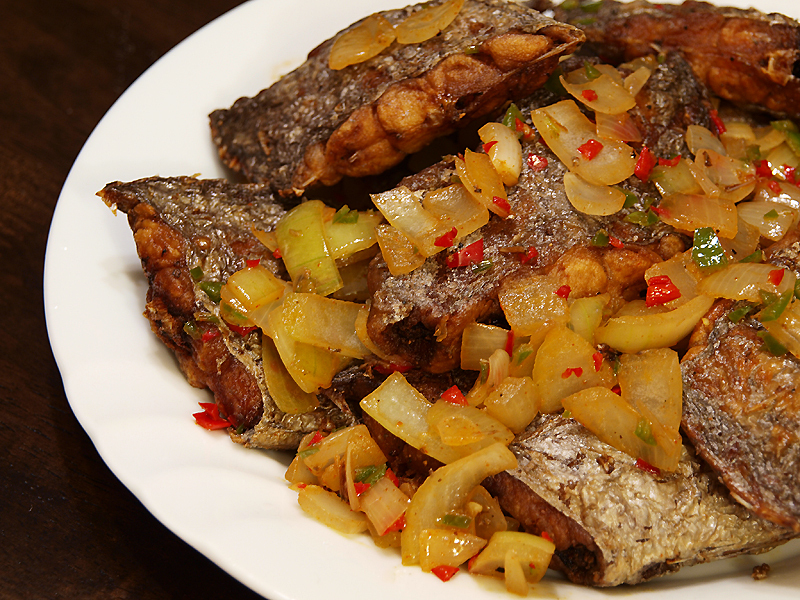 This recipe adds a spicy twist to your usual fried fish by adding sautéed chillies and onions in the mix. A good way to spice up any fried fish dish but works well on the real crunchy ones that’s why for this recipe we used deep fried frost fish, but any skinny / flat fish can be used just deep fry it until nearly half of the fish meat is golden brown. In a mixing bowl add fish, salt and freshly ground black pepper. Set aside for 30 minutes. Prepare a wok with lot of oil and deep fry frost fish in medium-low heat until crispy golden brown. Remove using a slotted spoon then set aside. Prepare another wok then add oil and sauté garlic, onion and chillies. Add fish then give it a good mix. Place in plate and squeeze lemons on top. What a great way to serve fish. I’ve never heard of Frost Fish! hi Raymund.my first visit here, thru networkblog. OMG – my hubby will drool over this, his diet is all about fish. I love it! And I always have chiles on hand.